Flute is a joy to play, for those simply looking for a hobby, and for more focused study. As a music educator I have years of experience teaching privately and in classrooms, for individuals and groups. I craft lessons to the needs and interests of each student, to ensure they are getting the most of our time together. Many of my students enjoy, for example, video game and TV show music - so, these pieces are some of the repertoire we'll work on together. My goals as a teacher are to instill proper playing technique, guide how to shape the music, establish good practice habits, and above all find ways to connect students with the music they're studying. At the end of the day, we play music because it's fun! As a music educator I have years of experience teaching privately and in classrooms, for individuals and groups. I craft lessons to the needs and interests of each student, to ensure they are getting the most out of our time together. Many of my students enjoy, for example, video game and TV show music - so, these pieces are some of the repertoire we'll work on together. My goals as a teacher are to instill proper playing technique, guide how to shape the music, establish good practice habits, and above all find ways to connect students with the music they're studying. At the end of the day, we play music because it's fun! Based in Park Slope, the Brooklyn Conservatory Community Orchestra is comprised of professional and enthusiastic amateur musicians who come together out of a love of music and performance. The BCCO puts on an annual children's concert at the Brooklyn Museum, symphonic concerts and various fundraising performances each year. Performed with the SFSO for their December concert series, presenting 5 pops concerts and 4 children's shows. I performed as a member of Sarah's backing orchestra for 3 locations during her tour. 130+ performances in cities located in nearly every state in the US, as well as 3 dates in Canada. 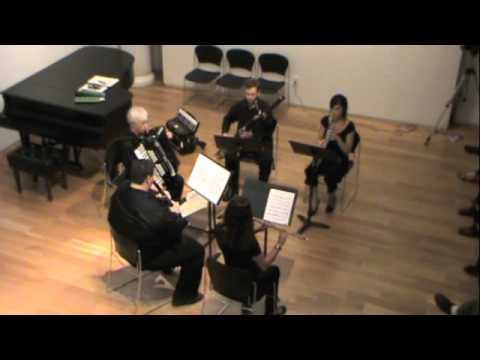 Bozza's "Fantaisie Pastorale," 2011 NYU Master's Recital.